This year was my 3rd year of participation, and I’m extremely happy to announce that I smashed my target of £1000 – by raising over £1200! Of course I wouldn’t have been able to get to that figure without the help of everyone who donated, and supported me along the way – with words of both encouragement and mockery… So thanks for that! 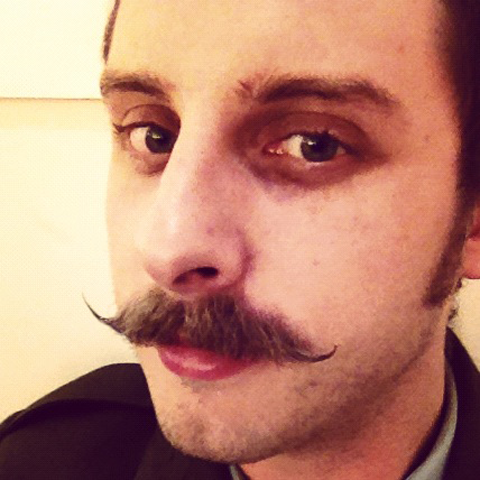 You can see my donation page here – with a load more pictures and other such moustache related nonsense! 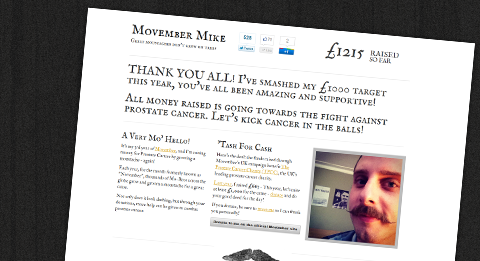 Not satisfied with simply having a new website to promote my efforts, I raised even more “cash for tash” by running an event in aid of the charity – Digital Sizzle! This is a side-project that me and 2 other guys set up, which we run in our spare time: a quarterly networking event for tech-types and media-moguls. We hosted the evening at the Adam Street Private Members Club on The Strand, and had over 250 people in attendance! We even had some moustache judging awards, with our special guest judging panel consisting of Omid Ashtari from Foursquare, Stephen Sobey from Yahoo, and Steve Webb from Google. Needless to say, much fun was had on the night, and a lot of money was raised for a worthy cause – over £3,000 in total from our team! Me and Chris Shanahan, Top Left Design friend! 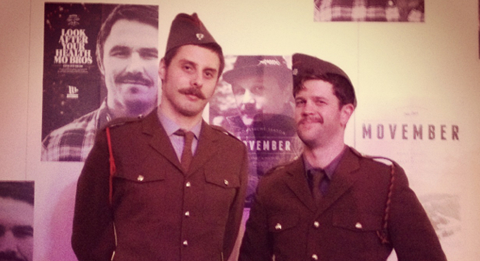 The next day saw no rest for the moustache, as I was off to the Official Movember Gala Parté – in full 1940’s military costume! I say this every time around, but it’s the best night of the year without fail – and I look forward to each and every one. There’s something quite special about a venue full of thousands of costumed men and women, all in a great happy charity mood! Nothing quite comes close in my opinion – there’s a fantastic atmosphere, and my kudos goes to the Movember events team for consistently throwing a brilliant party every year. Until next year, that is!